Shepherd Offshore is a family-owned and run business. We’re driven by a desire & passion to invest in the people, communities and economy of the North East. 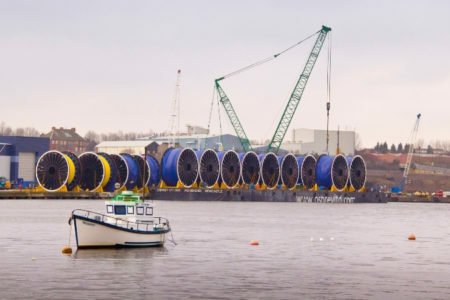 A developer of infrastructure & strategic property, as well as assets and operator business divisions, we deliver critical support services to the offshore, oil & gas, energy, marine, power and renewable industries on the River Tyne. We partner local & global industry with government support; from the responsible acquisition and regeneration of land, to the successful development of world class manufacturing clusters and residential & commercial projects. Established in the 1940s, our work continues to make a significant contribution to the growth of the industry in our region. Our aim is to create value through our strategic platforms, harnessing our entrepreneurial skills to effectively identify and develop opportunities to which we apply our renowned expertise and first class customer service in a professional, safe and efficient way. Founded by C.H. 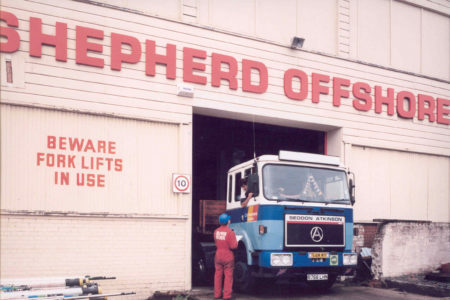 Shepherd and M. Shepherd, Shepherd Offshore Limited was incorporated in Byker in Newcastle’s East End in 1946. 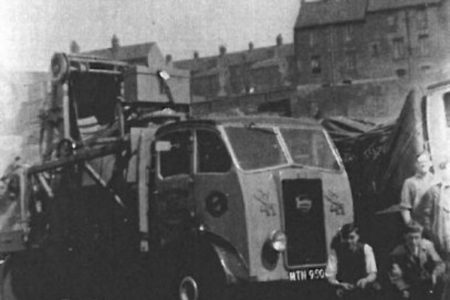 In that year, general haulage and transport company, CH Shepherd & Transport – proud owners of 15 vehicles – branched out from Shepherd Scrap Metals, which had been in operation as the core family business for over 50 years. 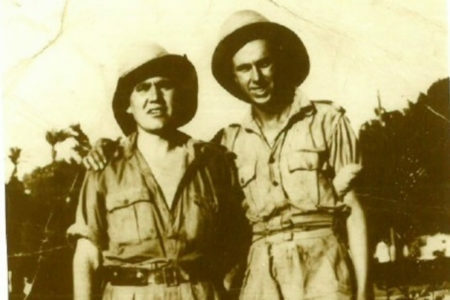 The driving force for the company was Charlie Shepherd, who, after returning from the war, established the initial transport company through hard work and dedication. The transport company moved a variety of goods from the North Shields Fish Quay & Newcastle Quayside down to the bustling markets of London. The company’s clients consisted of the National Water Company, a range of food suppliers, and the shipyards on the River Tyne, including Swan Hunter and the Walker Naval Yard & Brewery’s. The company regular serviced vessel’s on the Newcastle quayside day in and out. The 1950’s brought significant change for the company. The Shepherds immigrated to Australia and sold their transport business to the government, which then nationalised it. Whilst in Eastern Australia, C.H. Shepherd worked on the country’s railways, returning to the UK in 1957. Upon their return, C.H. 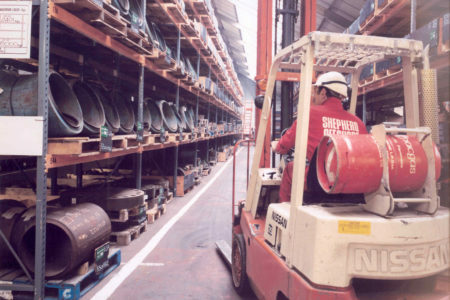 Shepherd and M. Shepherd bought their company back from the government and increased the number of vehicles in their fleet to 20, which heightened their goods transports to over 1,000 tonnes per year. 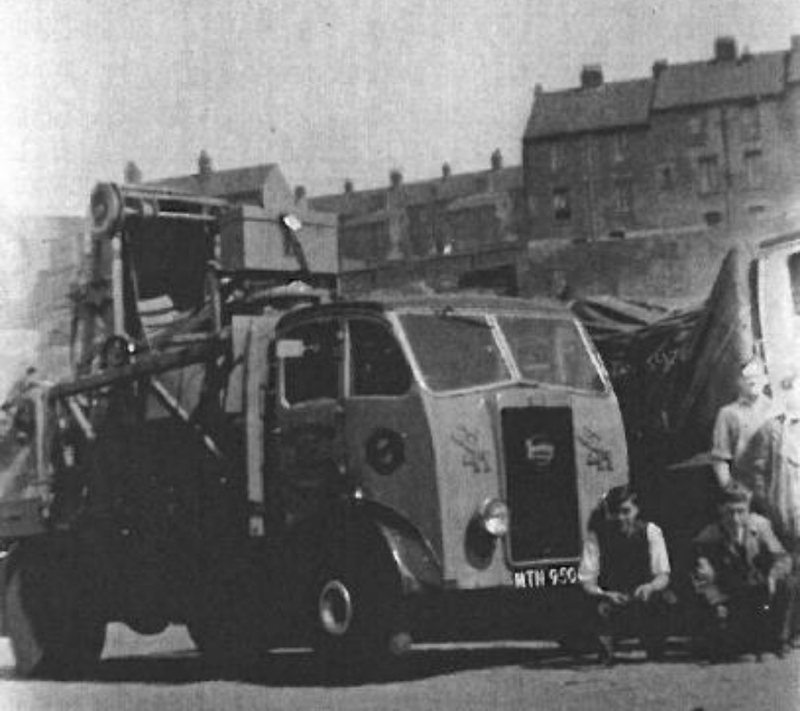 The company’s regional business focus attracted perishable goods clients from the Newcastle Quayside and Green Market as well as larger companies, including British Paints, National Water Companies, Newcastle Corporation, Metal Box and the Consett Iron Company. The Sixties saw C.H. Shepherd and Sons – Freddy and Bruce – double their fleet to 40 vehicles, and extend their routes nationally. The company also diversified into the management of storage warehouses and petrol stations, selling around 1 million gallons of fuel a year. 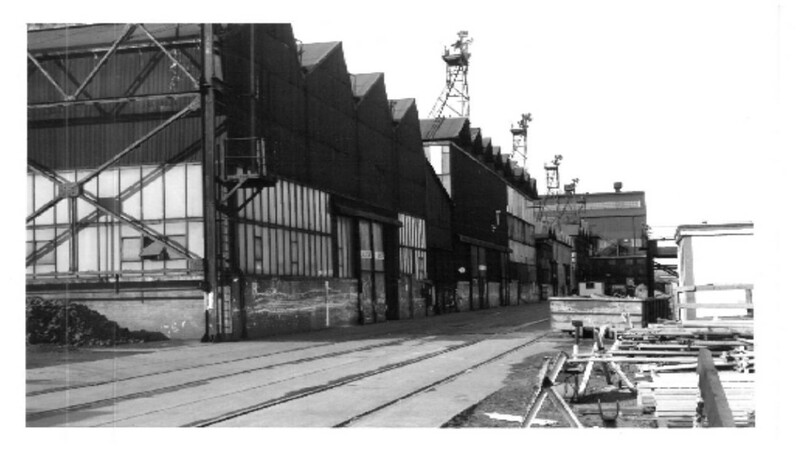 Clients in the early sixties included National Transport and Storage Swan Hunter, North East Marine, Naval Yard Walker, the Fruit Exchange Spitalfields, Covent Garden, Parsons, BTR Group and Newalls INS, Commercial Plastics. Later in the decade, the company expanded and opened its first London office in Covent Garden, with operations dedicated to transport and – for the first time – shipping. Together, Freddy, Bruce & their father applied their combined knowledge of the shipping industry and ignited the flow of business, dealing with shipping requirements on the Tyne with their 40 vehicles, which travelled between Newcastle and London every week. This new trade fed into the company’s established storage and haulage business. 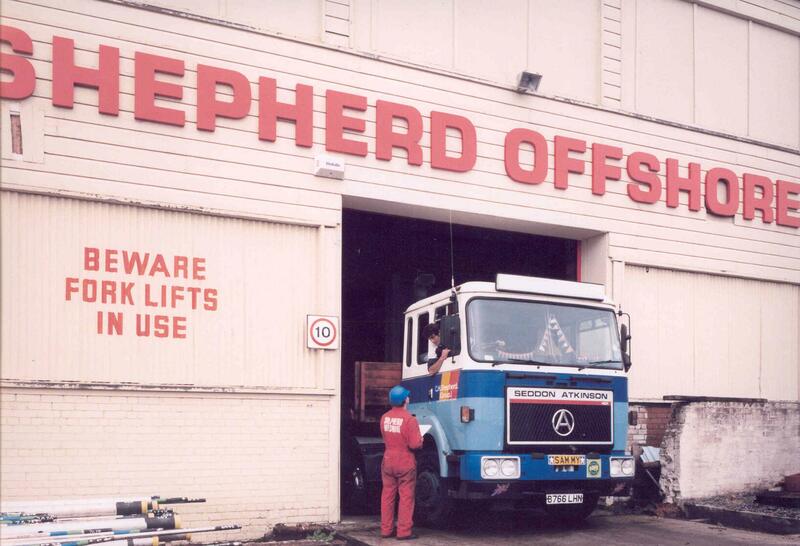 In the 1970s, Shepherd Offshore expanded again, adding cranage to its portfolio of transport and storage services. The company began to attract clients from the oil & gas and offshore industries, providing streamlined “just in time” transport and services to clients including Press Offshore, Charlton Leslie, RB Charlton and Swan Hunter. 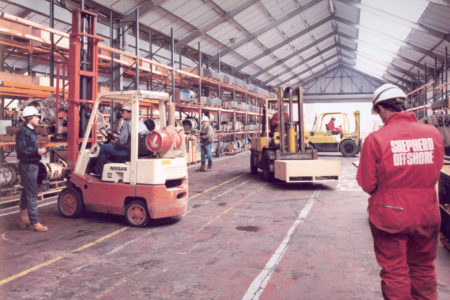 Additional expansion into new warehousing and storage capabilities attracted more clients from the oil and gas sector and, when the Materials Management & Distribution Centre purchased the White Street site in Walker, Shepherd added Conoco, British Gas and Parsons Power Stations to their impressive client base. 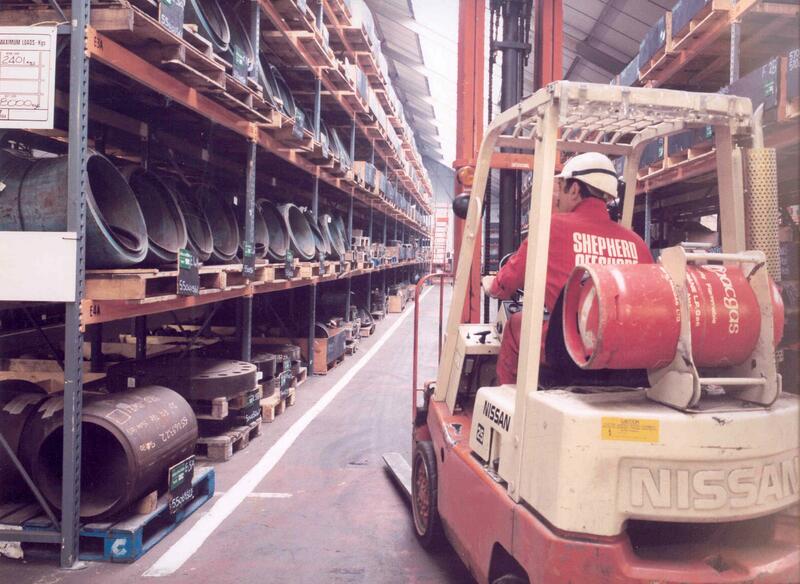 With ownership of over 50 vehicles, a fleet of cranes and 250,000 sq ft of warehousing by the end of the decade, Shepherd Offshore also owned 15 acres of operational land. By 1975 the company was providing services and support to the North East Marine for oil & gas clients, including Howard Doris and later, Press Offshore, Charlton Leslie, BTR and Amec. In the 1980s, Shepherd Offshore worked with major oil & gas, as well as fabrication companies including Press, Charlton Leslie and Howard Doris Ltd. By integrating into supply chains, the company provided added value to clients such as Marathon Oil and BP, Shell, British Gas, Agip, Luk Oil and Bechtel. 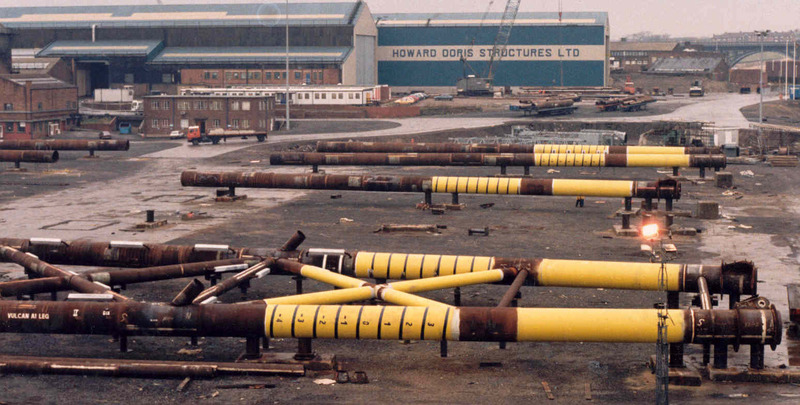 Between 1985 and 1986, Shepherd Offshore was involved in the strategic purchase and consolidation of three former shipyards in Wallsend – the North East Marine, Charlton Leslie’s and the Wallsend Slipway. The company strategically bought 80 acres of land and formed one major yard, demolishing a number of assets & infrastructure, including dockside cranes. The dry docks were filled in and slipways dismantled to develop a yard for the oil and gas industry and offshore construction market. This land was then sold to Press Offshore, igniting significant job creation along the Tyne. 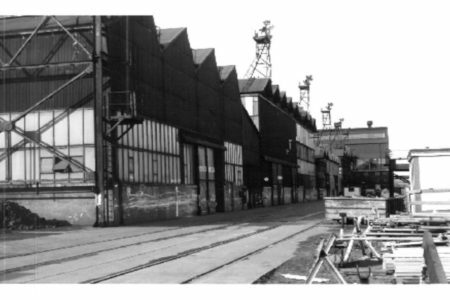 In 1986, Shepherd Offshore was asked to partner with Newcastle City Council in supporting the regeneration of the former Amstrong Naval Yard in Walker. Shepherd Offshore ran the facility and supported the development of the area, renaming the yard the Offshore Technology Park (OTP). This partnership formally marked the start of Shepherd Offshore’s commitment to responsible regeneration and bringing jobs into the region, while revitalising the once-great shipyards along the Tyne. 1990 saw the growth and merger of Dunlop and Coflexip at the Offshore Technology Park. The joint venture, with capacity and development plans supported by Shepherd Offshore, saw the creation of the DUCO venture between Dunlop and Coflexip at Walker Riverside in Newcastle. 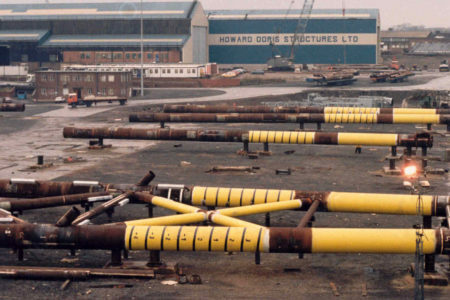 In 1992, Shepherd Offshore buy the Mercantile Marine Ship Yard on the River Tyne in Jarrow, developing and operating the site as a supply base for Brown Root Siapem and EMC. The 11-acre site was remediated and its dry docks filled to create a developable platform. Cemex, the world’s largest concrete manufacturer, currently occupies the site. In 1993, Freddy and Bruce Shepherd buy the Mitford Estate in Morpeth, Northumberland. The Estate is home to one of the first private residences designed by John Dobson, built in 1828, and comprises 5,000 acres of rural real estate encompassing 50 houses and seven farms. Between 1993 – 95, Shepherd Offshore bought offshore company Charlton Leslie and successfully provided specialist pipework for the oil & gas industry working at Amec Wallsend on Marathon, Concoco Philips and Judy Joanne top sides. After a number of successful years of operation, the company was bought from the group by Fabricom (UK) Ltd.
1993 also saw the start of the first phase of restoration at The Mitford Estate in Morpeth, Northumberland. Freddy and Bruce Shepherd authorised a large-scale, six-year programme of restoration and modernisation to begin the preservation of the Mitford Castle ruins, in partnership with English Heritage. Additionally, the Mitford Hall was completely refurbished and modernized. 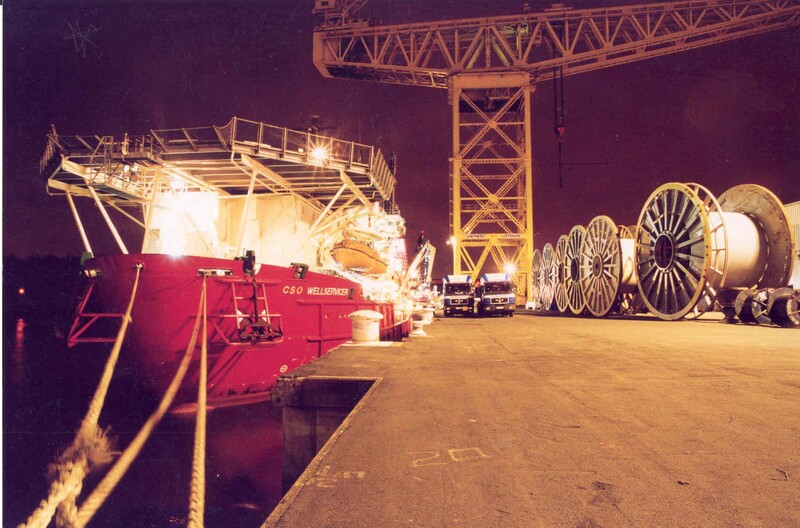 In 1994, Shepherd Offshore’s Bruce Shepherd entered into a partnership with Swan Hunter’s Jaap Kroese. 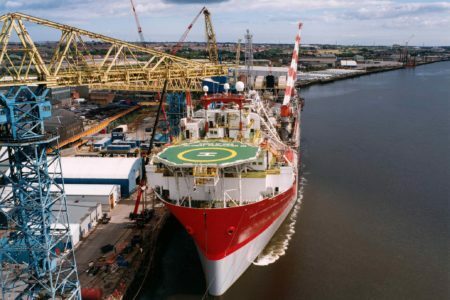 The 1994 – 2005 partnership supported the development of the Swan Hunters yard and provided support services for the AllSeas vessel, “Solitaire” – at 1000ft long, the largest pipe-laying vessel in the world – the FPSO Global Producer for Kerr McGee and saw the MoD award the build of two Royal Navy Vessels. Bruce Shepherd’s partnership saw the provision and employment of up to 400 personnel at any one time, including manpower from scaffolders to pipefitters. 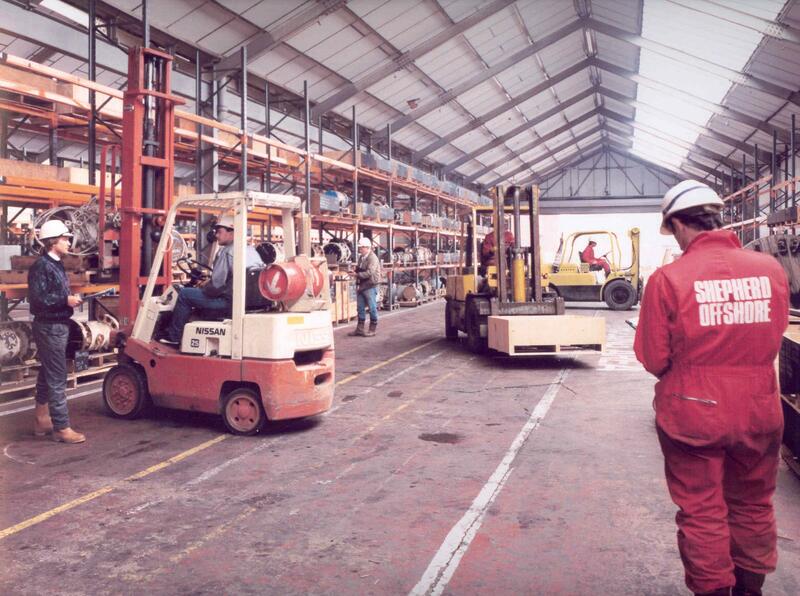 In 1995 Shepherd Offshore bought Metnor Scaffolding Ltd, resulting in an expanded service proposition and the employment of hundreds of personnel at Amec – across jobs such as Marathon, Conoco Philips, Judy Joanne and even at the Ministry of Defence at Rosyth. In 1996, Bruce Shepherd and Shepherd Offshore played a key role in attracting Gordon Chapman, the Chairman of Wellstream, to Newcastle. 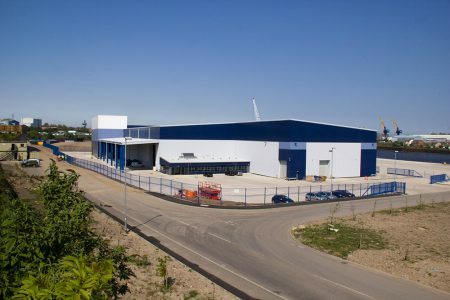 Following a meeting in Panama, Wellstream agreed a strategy of locating and building a flowline manufacturing centre at the Offshore Technology Park on the River Tyne. The factory was built, with a production capacity of up to 240 kilometers of pipeline each year, all of which could be made in Walker, Newcastle. Bruce Shepherd announced that he was “proud to confirm the commitment of Wellstream to establish a major manufacturing base supported by Shepherd Offshore”. In 1999, the Offshore Technology Park saw the Construction & Redevelopment of the South Quay. Over 200m of quay frontage and adjacent storage area was constructed, adding significant capacity for Shepherd Offshore’s clientele. Also in 1999, 45,000 sq ft of new manufacturing and office facilities were developed and built at the Offshore Technology Park for clients Duco Ltd and Co-Flexip Stena. 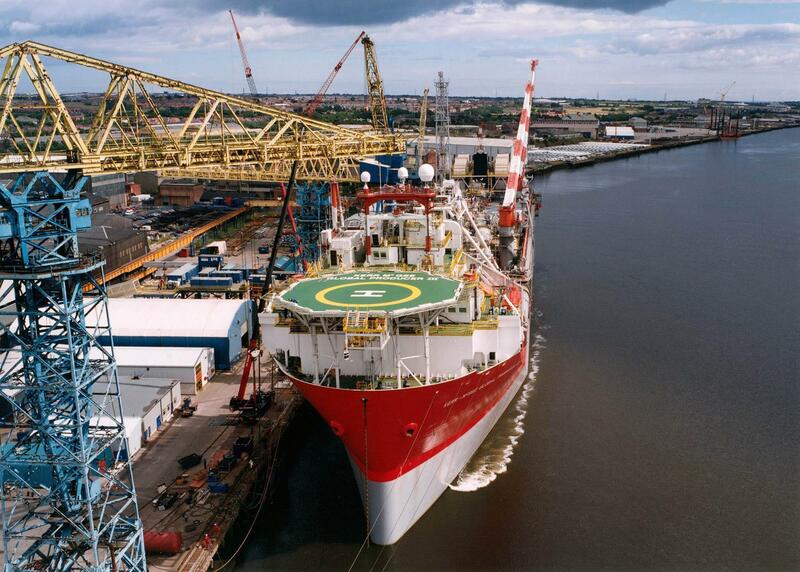 The 2000’s saw Shepherd Offshore form a second, world-class manufacturing cluster on the River Tyne in Newcastle, with the redevelopment of the Neptune Energy Park (NEP). The site was bought between 2007 and 2011, and secured over 100 acres of former shipyard land and surrounding areas, putting plans in place for the creation of jobs for the local community – and beyond. Also in 2007, Bruce Shepherd worked in partnership with the Princes Trust at the Mitford Estate, with the aim of raising more than £1m to support the charity’s work to help change the lives of disadvantaged young people in the North-East. In 2008, the Shepherd Offshore board agreed to back and support the government’s River Tyne North Bank Study, with its focus on responsible regeneration. The study’s mission was to create a world-class infrastructure, support the creation of jobs and attract manufacturing back to the River Tyne. In the same year, Shepherd Offshore bought the former Amec Yard in Wallsend, which had previously been the Press Offshore Yard, with the aim of significant job creation. Between 2008 – 2009, Shepherd Offshore developed the former Brims construction site in Wallsend, creating 89 houses in a joint venture with Bellway as part of the company’s regeneration strategy. In 2009, Freddy Shepherd bought the Northern Constitutional Club in Newcastle’s City Centre. The purchase was made strategically, in the hope of supporting development in the area. 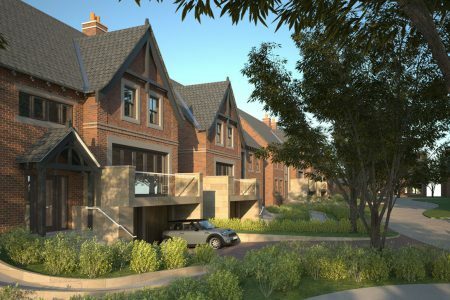 In the same year, the company acquired the 26,000 m² site of the former school, La Sagesse, which sits in 10-acre grounds In Jesmond, Newcastle. Between 2008 and 2012, remediation began across 100 acres of land at the Neptune Energy Park to ready the site for construction and development. Over one million tonnes of soil and materials were remediated, preparing the platform for development, and re-establishing the legacy of the shipyard. In 2009, Shepherd Offshore announced that the BBC would be filming 13 episodes of popular children’s programme Tracy Beaker Returns at La Sagesse in Jesmond. 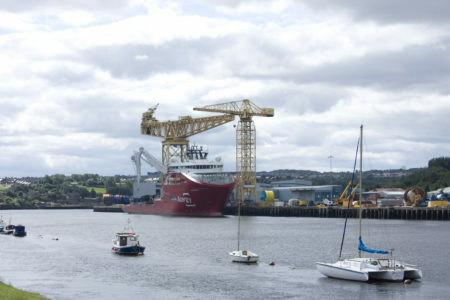 In 2010, MV Opus was the first vessel to arrival at Neptune Energy Park. 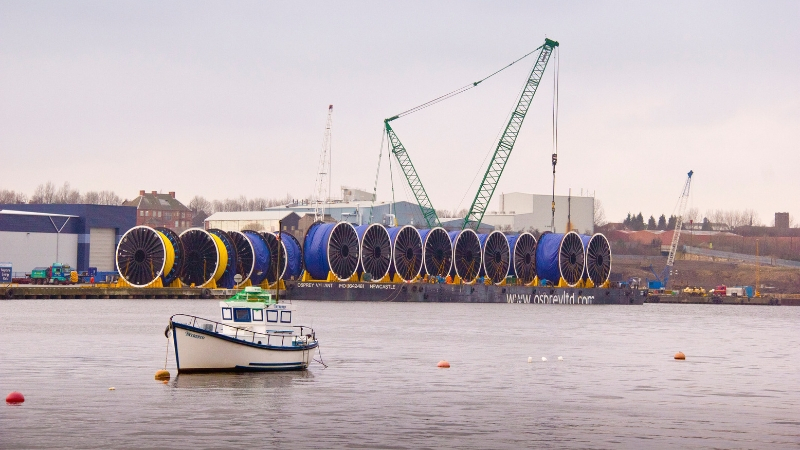 The vessel discharged blade moulds for 74m wind turbine blades, needed by Clipper. Once the moulds were offloaded, via tandem lift, the Shepherd Offshore team completed a complex lifting and handling operation. Further North, in Scotland, the Shepherd Offshore board bought The Halbeath Interchange, near Dunfermline, in 2010. The site, situated a mile from the Forth Road Bridge, was originally developed for semiconductor manufacturing and, with adjacent land, covered a total of 150 acres. The 93,000 sq m building had been vacant since 1998 and, whilst serviced and partially fitted-out, had not been completed, offering a variety of opportunities for alternative and re-development. 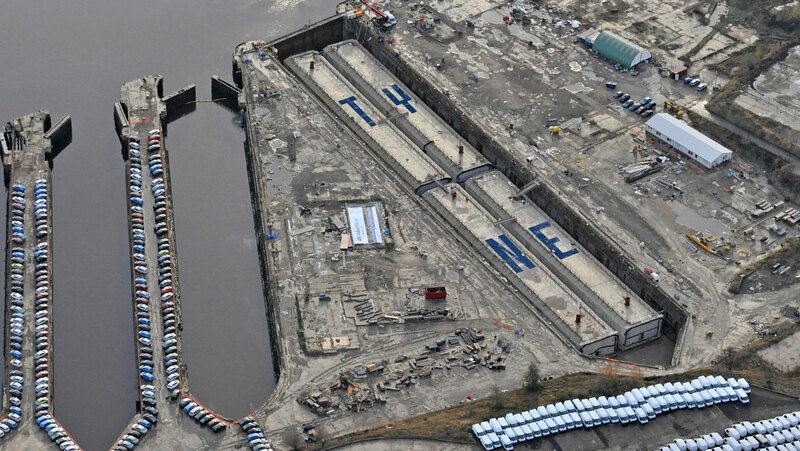 In the same year, four 90m concrete structures were successfully constructed in the Neptune Energy Park Dry Dock by Bouygues Travaux Publics and sailed away for use in Tyne Tunnel 2. In 2011, Shepherd Offshore Chairmen Freddy & Bruce Shepherd, Bridon Chief Exec Jon Templeman & Deputy Prime Minister Nick Clegg announced Shepherd Offshore’s building of a new state-of-the-art facility for the Bridon Group at Neptune Energy Park. In 2011, remediation of the Halbeath Interchange was approved. The preparation of the site to allow redevelopment included the demolition of the main microchip factory, due to its specialised configuration and as such restrictions to further users. Between 2011 and 2014, Shepherd Offshore supported TechnipFMC in the major expansion of their manufacturing capabilities. Shepherd provided over 9 acres of remediated land for development in the construction of a world-class vertical helix assembly machine (VHAM) and extrusion line at Offshore Technology Park, dismantling and relocating vital and existing facilities. Permission was also gained to fill three dry docks and reclaim the land, as the resulting modern industrial space would allow further tenants to base themselves on the banks of the river. This move followed Clipper’s decision to locate there. In 2012, the Shepherd Offshore board looked to work with all stakeholders for the Halbeath Interchange site, two thirds of which was earmarked as a location for a potential new college, as well as 500 homes. The remaining third was designated as a potential site for industry and education. In the same year, the producers of Tracy Beaker Returns at the BBC returned to film another season of the programme at La Sagesse. In 2012, Freddy Shepherd announced plans to turn the historic La Sagesse site into one of the North East’s most exclusive housing complexes. 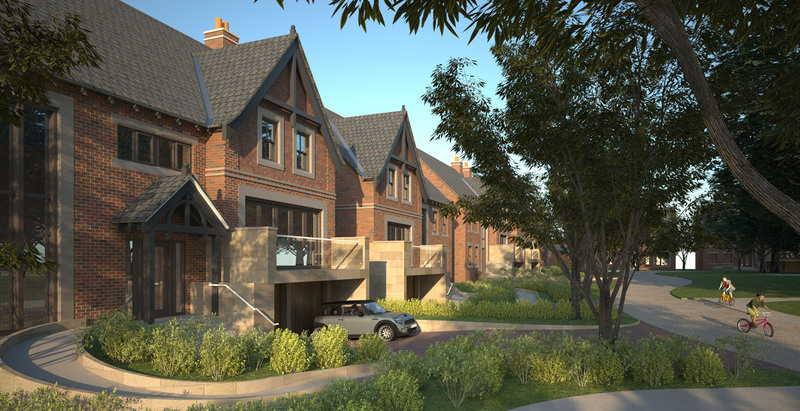 Sixty private dwellings – apartments and houses – were proposed for the site as part of a multi-million pound development. Mr Shepherd said the development could create up to 250 jobs and would help preserve Jesmond Towers and the surrounding 13 acres of land. In 2012, Neptune Energy Park was recognised as a Local Enterprise Zone (LEP), and awarded Local Enterprise Status for its successful development of the Marine and Subsea sector, along this part of the River Tyne. The development was reported to be well placed to take full advantage of the Enhanced Capital Allowances incentives. In 2012, Shepherd Offshore entered into a partnership to design and build a state-of-the-art training centre for Renewable Energy training at Newcastle College. The 20,000 sq ft Energy Academy facility is strategically positioned on Wallsend, Hadrian Rd. 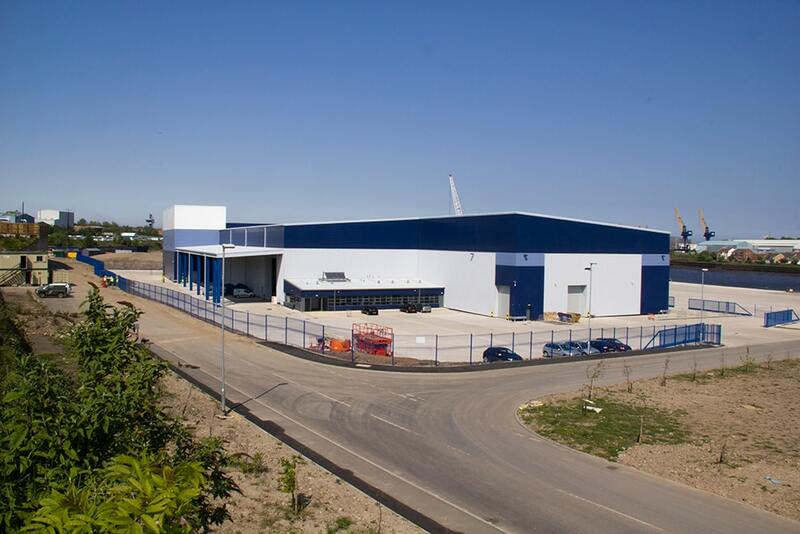 In 2012, Bridon International co-located within Neptune Energy Park, with Shepherd Offshore building a bespoke 85,896 sq ft manufacturing facility with capacity to produce up to 700 tonne reels. The facility has a total cost to build and fit out of over £30 million. The project brought a further 9000 tonnes of increased rope manufacturing capacity to the NEP, securing over 150 jobs and creating a further 50 positions. In 2012, Minister Michael Fallon and Nick Brown MP opened the new Bridon Facility. 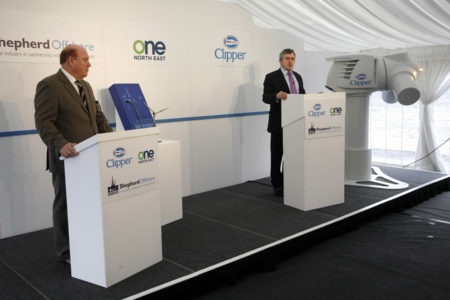 The manufacturing facility was expected to develop the world’s largest ropes for offshore use – a true global leader. Bridon Chief Exec Jon Templeman said “I’m proud to announce today that Bridon Neptune Energy Park facility is open for business on Tyneside, thanks to the support and ambition of Shepherd Offshore”. In the same year, Shepherd Offshore’s 250t hammerhead crane at the Offshore Technology Park was upgraded to SWL 325t. The new 325t hammerhead crane was designed in conjunction with Konecranes and Des Cad. The actual works took over 6 months; modernising the crane and its mechanical and operating capabilities to create much needed capacity and allowing for the development & expansion of our client’s product ranges. In 2013, the Shepherd Offshore office relocated to a new modern facility on Rendle Road. The new office space was built by Elliott Associates as part of the Technip Newcaflex deal. In 2013, Shepherd Offshore invested in a heavy load out platform with a 700mt lift capacity. The platform, measuring 27m x 36m, allows a blanket load of up to 7300mt and provides a critical gate way to all users of the Neptune Energy Park facility. A capital dredge programme at Neptune Energy Park was completed in 2013, and currently allows up to 9m below chart datum to be achieved. 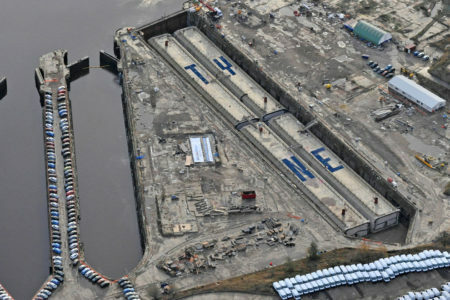 This provides a vital gateway to all users to and from the River Tyne, and future-proofed capacity for Shepherd Offshore. In 2013, Shepherd Offshore completed the sale of La Sagesse with planning for development to David Wilson Homes, part of the Barratt Group. 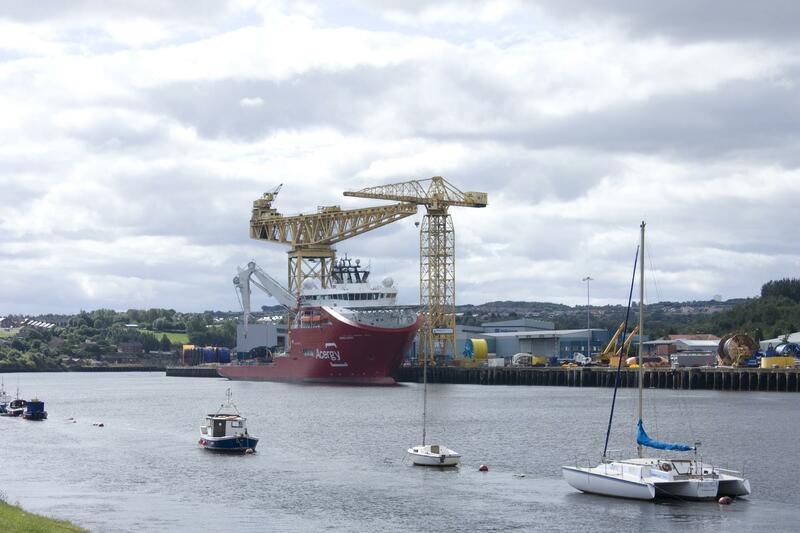 In 2013, the vessel, Fugro Symphony, became the 2000th vessel to visit the Offshore Technology Park in Walker. It carried out project ‘valiant causeway’ from Technip Umbilicals, and a spooled load-out from TUL factory carousels C&F. In 2013, Shepherd Offshore purchased the Palace of The Arts with the aim of refurbishing the facility, and bringing it back into use.